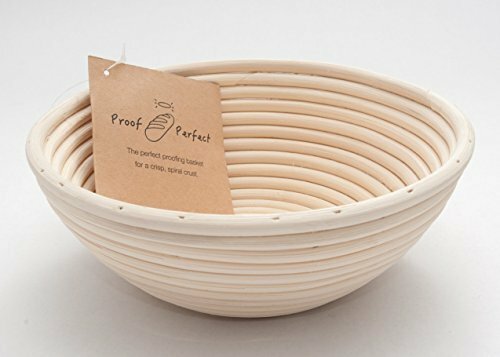 The Proof Perfect dough proofing basket - also called a banneton or brotform - is handmade using natural rattan coils and draws moisture from the dough as it rises to create a crisp, spiral crust for an artisan-style bread. Instructions are included. ECO-FRIENDLY: Hand-made with renewable, natural rattan. WELL-CONSTRUCTED: Sturdy structure provides optimal wall height for proofing a traditional, high loaf. CRUST-CRISPING COILS: Coils draws moisture away from dough surface for a crispier, rustic crust when baked. ARTISAN SPIRAL PATTERN: Creates signature artisan spiral patterns in your bread's crust. INSTRUCTIONS INCLUDED: Get great tips for using and caring for your Proof Perfect basket. If you have any questions about this product by Proof Perfect, contact us by completing and submitting the form below. If you are looking for a specif part number, please include it with your message.